For today's Latest Developments, I wanted to take some time to talk about Modern and give you all a few thoughts about how the format is doing and what its future looks like. A few weeks ago, I spent an article looking at the state of Standard. While I don't think I can talk as comprehensively about the state of Modern, I can say that by my measurements, it is in a good spot right now. With the (somewhat) recent bannings and unbannings, we've gotten to a point where there are control decks in the format (using Nahiri, the Harbinger, and some of them not even playing blue), a lot of good aggro options with Affinity and Zoo decks, and plenty of good combo and midrange decks. Merfolk is showing up as a tribal deck, Tron is still a top-tier deck, and people are even playing some Eldrazi (but at fairer rates than three months ago). It was hard to evaluate the Splinter Twin ban when it first went down, due to how huge of an impact the Eldrazi deck was having on the format. It's possible that if we hadn't banned Splinter Twin it would've done a reasonable job of combating at least some of the Eldrazi decks, but I don't think it would've made for a healthy format. I know a lot of people want their Splinter Twin decks back in the format, but I do think it's better without them. There are still a few cards that we within R&D have our eyes on, but nothing that has proven to be a problem yet. As a whole, Modern is (at least in my opinion) in the place we have been hoping it would get to for years. We knew it would take a while for the format to grow in popularity, and for people to really explore what was there, but I think we've hit a point where Modern has matured into its own format, not just Legacy Lite or Standard Plus. The lack of a Modern Pro Tour is something that I think will, as a whole, be good for Modern. The thing about Pro Tours is that they tend to solve formats. Each new set with Standard offers a high percentage of the entire format in new cards, but each new set offers very little for Modern relative to the size of the format. In an ideal world, enough cards would be added to Modern each year so that the new Pro Tours have a pretty fresh environment, but that's (unfortunately) just not how things have played out. Modern isn't a format about constant change, not in the way Standard is. There are just not going to be a few new decks per year at each Pro Tour's Top 8. They may be new builds, but probably not a sea change in the format year after year. And I think that's good. As a group, R&D doesn't want to constantly reshape Modern each year. If you want a format that is constantly shifting, we have Standard. Modern is, at least I believe, a format that people enjoy because it shifts slowly and doesn't require quite as much work to keep up with. And I'd much rather see it stay that way, at least for the foreseeable future. The goal for Modern is that it will continue to shift and change with the release of Standard sets, albeit at a slower rate than Standard changes. We want Modern to exist as a format that allows people to take their Standard decks when they rotate and play them in Modern, with the requisite changes to improve them for Modern. For example, if you really like playing the Mono-White Humans deck in Standard, you can play that same deck in Modern, and get to add more powerful lands, Champion of the Parish, and Path to Exile for removal. Other decks, like the Mono-Black Devotion deck from Standard two years ago, will likely not be as competitive, but is still at a power level that you can compete at the FNM level, assuming you aren't expecting to win every week. To make that kind of thing happen, we need to keep printing cards that are actually strong enough to compete in Modern. While we aren't going to print nearly as many cards that can outclass or even just compete with the most powerful cards in Modern, we are going to print cards that can either fit into metagame shifts or work as new options for decks to run. 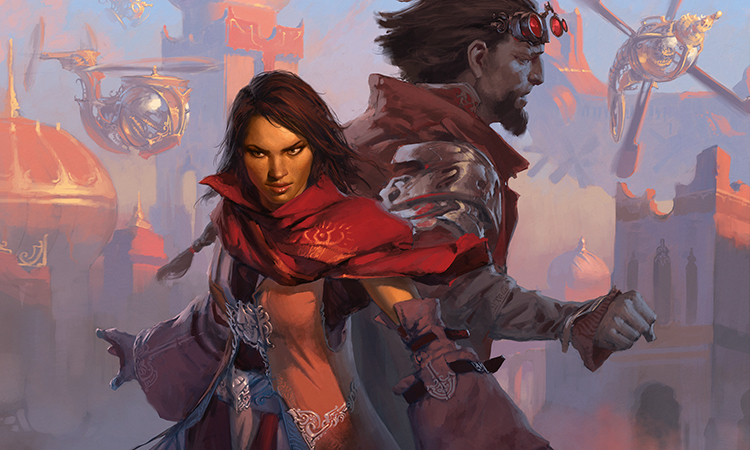 Looking back over the past year and a half, we've had a lot of cards from Standard sets make splashes in Modern. Ignoring the delve cards we needed to ban (more on them later), we've seen such cards as Monastery Swiftspear; Become Immense; Kalitas, Traitor of Ghet; Kolaghan's Command; Jace, Vryn's Prodigy; Monastery Mentor; Ugin, the Spirit Dragon; Pia and Kiran Nalaar; Nahiri, the Harbinger; Collected Company; Reckless Bushwhacker; the list goes on. While these may not be as impactful as cards like Chrome Mox, Valakut, the Molten Pinnacle, or Snapcaster Mage, they go a long way toward rounding out the format and keeping it fresh and interesting. As a whole, this is what we want Modern to do—evolve slowly over time, taking some of the top cards from Standard but retaining its own identity. So, Can You Print Cards Just for Modern Now? One thing I hear people ask for a lot is a product that lets us print cards straight into Modern without them going through Standard. The kind of place to put cards like Counterspell, Force of Will, Wasteland, or whatever other cards people think would make Modern more fun. Well, we can debate whether or not those cards would help, but that product itself is not something we currently plan to do for Modern. Those examples are kind of extreme, and I do believe there would be cards that could make Modern more interesting—like the Onslaught cycling lands—but I also believe that the current way of getting cards in the format is better than trying to pick out things we think would be fun and add them. For the foreseeable future, cards will only become legal in Modern by coming through Standard. The first reason for this is that we actually playtest these cards extensively, so we have a much better idea about how strong they are in the abstract, but it also accomplishes the goal I mentioned earlier of letting Standard decks become Modern decks when they rotate out. The second is that we don't want to release sets that intentionally shake up Modern, then end up making people's experience less fun, or forcing them to chase cards or new decks. I don't think that is what the majority of people who play Modern are looking for. We tried this for a while with Legacy, and I think the results were not great—look at True-Name Nemesis in particular. That's what happens when we aim a card at Legacy and hit higher than expected. While some of the cards we added, like Flusterstorm, Scavenging Ooze, and Shardless Agent, probably worked, we could've printed those in sets that got more one-on-one testing than Commander or Planechase. The cards that have become Modern playable from Standard sets are cards that were probably a bit stronger than we expected them to be. We aim cards at a specific power band, and some hit high and some hit low. If we start aiming cards for the kind of power needed to impact Modern, we would probably be very disappointed when we end up hitting higher than expected. Nobody in Magic R&D wants to dictate what the strongest deck in the format is. We will ban something if we think a deck or card is doing too much, but if we know that something else would then be the strongest deck, we would probably ban something from that deck too. The goal is to keep the top of the pyramid of decks as flat as possible, with a lot of tier 1 decks, so that people have a wide variety of things to choose from. Now, we are going to end up printing things that make Modern less fun, but never on purpose. Look at Eldrazi Winter. We had a general idea that Eye of Ugin and Eldrazi Temple would work well with devoid. We honestly didn't think Eldrazi Skyspawner would show up in the Top 8 of a Pro Tour. We didn't choose devoid as a mechanic because of those cards, but we also didn't dismiss it because of those cards. And truth be told, things looked pretty interesting when Battle for Zendikar came out, with several new decks coming out that were pretty solidly tier 2. The problem came with Oath of the Gatewatch and colorless mana cards. Adding cards like Thought-Knot Seer, Eldrazi Mimic, and Reality Smasher took the Eldrazi deck over the top. It dominated Pro Tour Oath of the Gatewatch, and the PTQ and GP scene. We were quick to ban it, but we don't like it when these kinds of things happen. There were plenty of conspiracy theories about us making this super powerful to promote the set, but that couldn't be further from the truth. What we want to do is print cards that make an impact, but do so in a positive way. It looks very bad for us whenever we release a set that totally demolishes the metagame, and it's not something we ever aim for. We want to introduce new things, not make everything else unplayable unless you add cards from the newest set. That's a very bad road to go down for a non-rotating format, as it requires constant power creep that will make things very unfun very quickly. For this particular situation, it's interesting to look back at it and try and figure out what we would've done had we known just how dominant the deck was going to be. We could've not made the colorless mana cards, but I actually think those were the coolest implementation of the Eldrazi cards in Battle for Zendikar block. We could've pre-banned Eye of Ugin or Eldrazi Temple, but I think that would've also made people pretty unhappy. I think the Eldrazi Winter was pretty unpleasant both for people who saw their decks outclassed for a few months and for people who scrambled to acquire the cards only to see their deck banned. It's unfortunate, but I think that's the kind of unpleasantness that is acceptable for a format like Modern, as long as it doesn't happen too frequently. If this kind of thing were happening once a year, it would be time to re-evaluate what we are doing and fix something. As it is, I think the process is working pretty well. Modern is as healthy as it has ever been, and I hope that by keeping the strategy we've been going with for a while, we can ensure the format will remain healthy. That's it for this week. Join me next week for more tales from Magic's development.